วันนี้ (22 พฤษภาคม 2559) ซึ่งเมื่อ 2 ปีที่แล้ว (2557) เป็นวันที่ พล.อ.ประยุทธ์ จันทร์โอชา รัฐประหารรัฐบาลของ นางสาวยิ่งลักษณ์ ชินวัตร อดีตนายกรัฐมนตรี ทั้งนี้ ที่เฟซบุ๊ก Yingluck Shinawatra นางสาวยิ่งลักษณ์ได้โพสต์ทวงสัญญากับ คสช. เกี่ยวกับสิ่งต่าง ๆ ที่ คสช. 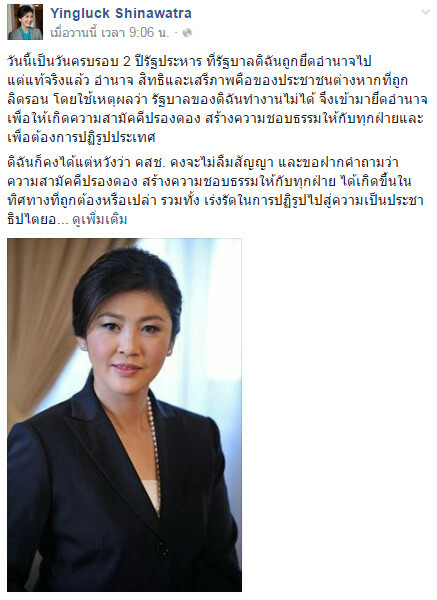 จะแก้ปัญหา ทั้งเรื่องของปากท้องประชาชน รวมถึงเรื่องประชาธิปไตยที่แท้จริง ดังข้อความต่อไปนี้..
Today is the 2nd anniversary of the Coup d’état that removed my government from office. More importantly it was the day that the people’s rights and freedom were taken away. They justified this action by claiming that my government can no longer govern the country and it must be them in charge in order to proceed with reconciliation process. I can only hope that the NCPO remembers what they promised to the people. I would like to ask them whether the reconciliation process has been inclusive and if it’s going in the right direction or not. I also hope that the NCPO will accelerate the implementation of reforms that will move the country back towards path to democracy as specified by their own roadmap. I have growing concerns because today, the people are suffering from economic hardship, poverty and critical social issues including increasing drug use. I wish that they will swiftly return happiness to the people, by happiness I mean the basic rights and freedom that will allow the people to once again choose their own destiny. They must also urgently address the problems facing the people. I believe that this is the best and only way out for our country. This will ensure that the past two years would not have been wasted. I remain hopeful that this will be the case.